People interested in purchasing an espresso machine are quite often intimidated. Espresso machines tend to be complicated to operate, especially for a beginner. They are also expensive, and espresso machines for the home can take up a lot of room into the bargain. For these reasons, people shy away from buying espresso machines that could actually be great for them. Today we're going to discuss an alternative to a traditional espresso machine, and we think you'll be happy to know you don't have to have a whole lot of space for the machine, nor do you need to spend a great deal of money. Additionally, the machines we are here to talk about today aren't necessarily complicated to operate. When you use a specially designed combination coffee espresso machine, you can make multiple morning drinks including coffee, espresso, lattes and cappuccinos. We can’t promise that you’ll look anywhere near as cool as your local barista, but we can promise that some of these machines can pull a great shot of espresso while also brewing a traditional pot of coffee. Keep reading for our detailed reviews of the 5 best machines we have found. When it comes to true espresso, DeLonghi is a name that stands out. 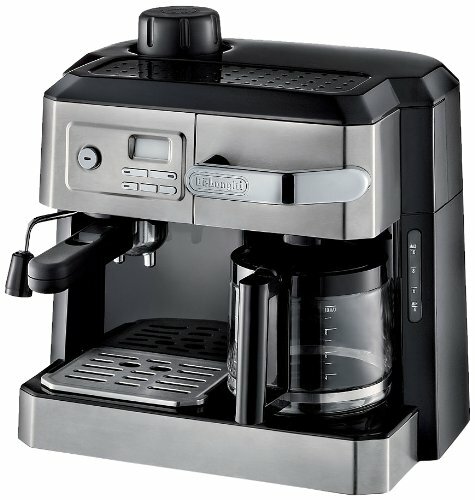 This machine from DeLonghi is a multitasker, as it can make drip coffee as well as espresso, lattes and cappuccinos. You won’t have to wait on half of the machine to complete its brewing cycle before moving to the next task. Inside this machine are two separate thermal blocks that allow the different parts of the machine to function alone or to work together, whichever you choose. The advanced water filter ensures that you get no funky tastes in your coffee or espresso, as all impurities are eliminated in the filtration system. If you want to wake up to the smell of fresh coffee in the morning you can utilize the 24 hour programmable settings to accomplish this. Unfortunately, this setting only works with the coffee function, not the espresso function. You can also program this to be a daily occurrence, so you won’t have to reset the timer all the time. DeLonghi provided a patented frother system called the “Swivel Jet” that allows you so steam your milk so that you can make specialty drinks like lattes and cappuccinos. A true multifunctional masterpiece, this 3-in-1 machine from AICOOK is a real crowd-pleaser. Using this machine, you can rack up espresso and drip coffee as well as creating specialty coffee. If you’re in the mood for a latte or cappuccino, you can use the built-in steam wand to froth the milk up perfectly. The LED control panel is easy to read and simple to program taking all the guesswork out of whipping up your favorite coffee drinks at home. The water tank makes things super-simple as well. You won’t have to make sure the machine is near a water source since the tank is removable. Refilling is a breeze. Also, you can monitor the level of water in the tank fuss-free since it’s transparent. You won’t be standing on ceremony either since this machine is self-priming. There are 2 thermostats that control the temperature for the water and steam settings making sure you’re good to go whenever you need a bracing jolt of caffeine. It was a long journey for the creators, but Keurig has made quite a name for itself in the world of coffee making appliances. With the K-Café, many at home wannabe baristas can get all the taste of their favorite coffee shop drinks without having to drop too much cash on them. As with all things Keurig, you will need to use a K-Cup pod with this machine. 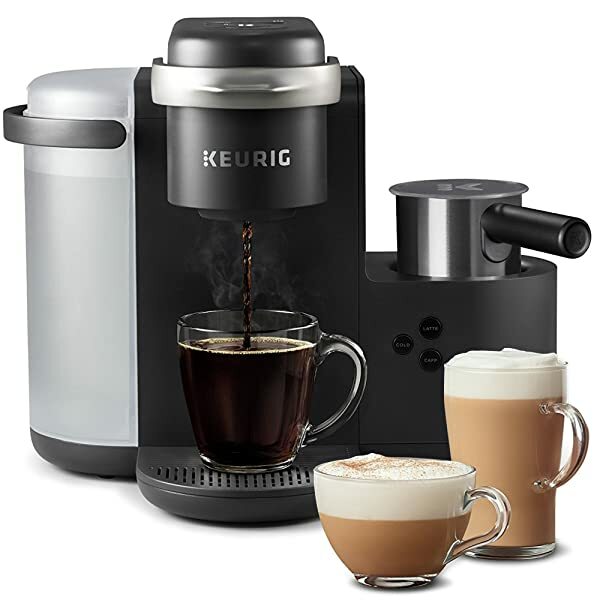 You can use any K-Cup to brew regular coffee or make lattes or cappuccinos. If you want something similar to an espresso shot, press the “Shot” button on your Keurig machine and your K-Café will deliver a shot of concentrated coffee into your cup. While it will never be true espresso, it is as close as you’re going to get with a machine like this – but that is not a problem. You can increase or decrease the brew strength of your coffee, allowing you even more customization. If you like milk frothed, you can utilize the frother to do this, and it will even froth almond, soy and skim milk too! Additionally, you can brew into multiple cup sizes choosing from six, eight, ten and twelve ounces. The 60-ounce removable water reservoir saves you time since you won’t have to refill the machine constantly. While Nespresso may claim that this machine of theirs can make true espresso, it cannot. 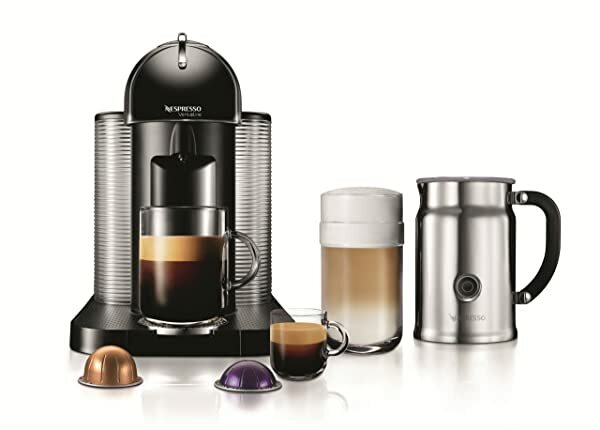 Instead it uses Nespresso’s patented Nespresso capsules to make drinks that are similar to espresso. The drinks are fantastic, but without the steam and showmanship of a genuine espresso machine, they will never be genuine espresso. That being said – the VertuoLine still has plenty going for it. Using the Nespresso capsules is simple, as they insert and eject easily. The internal capsule container can also hold up to 20 used capsules, so you don’t have to empty it daily. The machine heats up fast, taking a mere 15 seconds to be ready to brew your coffee, and preparation couldn’t be easier. Simply choose your cup size from the three available options of 1.35oz, 8oz and 14oz, press a single button, wait a few seconds and then you will have your cup of joe to enjoy. The included Aeroccino milk frother allows you to easily prepare cold or hot milk froth so that you can create your specialty drinks like lattes and cappuccinos. Though you can’t enjoy a true espresso from this machine, you can get pretty close! 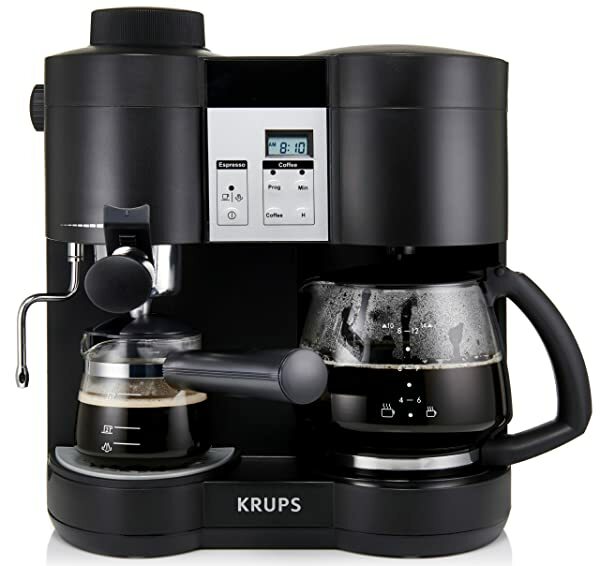 Another name known for their coffee appliances, KRUPS brings forth their XP160050 Machine. This machine is a two in one offering as it can brew both espresso and drip coffee. The coffee carafe can hold 10 cups of coffee which is plenty to get through a frazzled morning. If you need to quickly grab a cup in the middle of brewing, that is no problem. Simply utilize the “pause and serve” feature and get yourself some coffee, then allow the machine to finish brewing. Don’t worry if you forget about your prepared coffee, as the machine will keep it hot for up to two hours before automatically powering down. The espresso side of the machine brews real espresso shots. 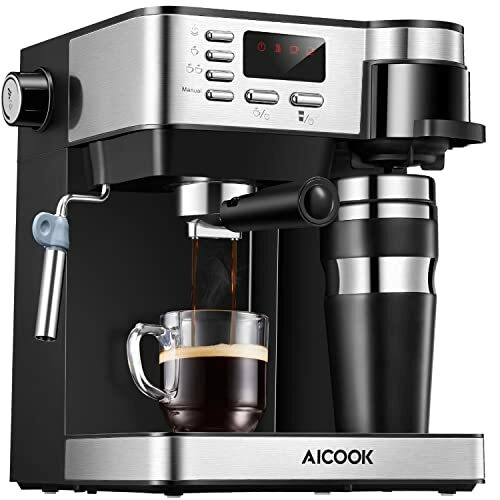 It can make four cups of espresso and utilizes a 4 bar steam pump system to make the shots. The stainless steel steam wand allows you to froth your milk so that you can make specialty drinks like lattes and cappuccinos as well. Unfortunately, many parts of this machine are comprised of plastic, which we know is not long-lasting. For coffee lovers and espresso connoisseurs, it would be ideal if we could just bring the entire coffee shop home with us – including the barista. Seeing as this is not a feasible option, it is nice to have the opportunity to bring a piece of it home in the form of these coffee and espresso maker combo machines.